Newly renovated urban warehouse in South Denver that features expansive ceilings, wood beams, exposed white brick and corrugated steel accent walls. Venue pricing includes tables, chairs, mobile bars, and audio/visual equipment. Congratulations on your engagement! You found each other and now it is time to find a place to celebrate this memorable occasion with family and friends. The Studios at Overland Crossing is the ideal location for you to tailor your reception needs and vision. The Wedding Package is inclusive of the following and other wedding celebrations can be accommodated without the full reception package. Ceremony and Reception Package Inclusive of: •	Six Flat Screen TV’s are available for visual content in the Center Studio •	Four Flat Screen TV’s are available for visual content in the South Studio •	Microphone for general announcements via house sound •	Background digital music system •	Complimentary parking for your guests •	A variety of tables and chairs with seating up to 200 •	In-House banquet tables for design in the head table, cake table, and gift tables •	Preset house lighting •	Basic housekeeping services Rental Policies: •	12 hours of rental unless otherwise arranged. The rate is not pro-rated should you not use the full block of time. •	Select from a qualified list of preferred caterers to service your menu needs or use your own caterer. You are able to bring in your own liquor. •	Entertainment companies are prohibited access to the in-house audio system, they will need to provide the event all amplified sound needs. Basic audio equipment is provided with MP3 capabilities. •	A pre-set lighting package will be offered in a dramatic color scheme showcasing your select preferred colors. •	A certificate of insurance is required naming the Studios at Overland Crossing as additionally insured. •	The Studios at Overland Crossing will set up and tear down our equipment (tables, chairs, etc.) to your specifications. •	Day-of event management services are available for an additional fee. •	We require a non-refundable deposit of $1,000 to hold your date with the balance due 60 days prior. •	The South Studio is perfect for ceremonies and cocktail hour. The Studios at Overland Crossing re-opened in 2012. 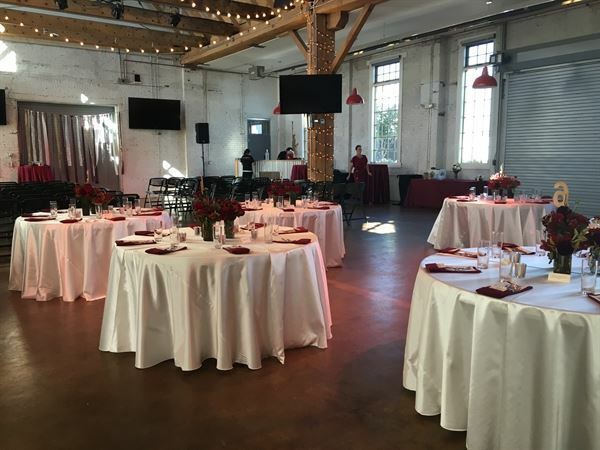 The building was originally built in 1881and after extensive renovations, it is a state-of-the-art venue while retaining it's industrial charm. This urban historic property in South Denver is conveniently locate off Santa Fe Drive and Evans Avenue with direct access to light rail, via the Evans Station. Energetic, open, and urban, the Studios at Overland Crossing is perfect for social celebrations, day meetings, non-profit fundraisers and educational forums.